Was checking out the new Body Browser by Google. Yogis seem to be very knowledgeable about anatomy and physiology, so perhaps this might be a useful instructional tool. 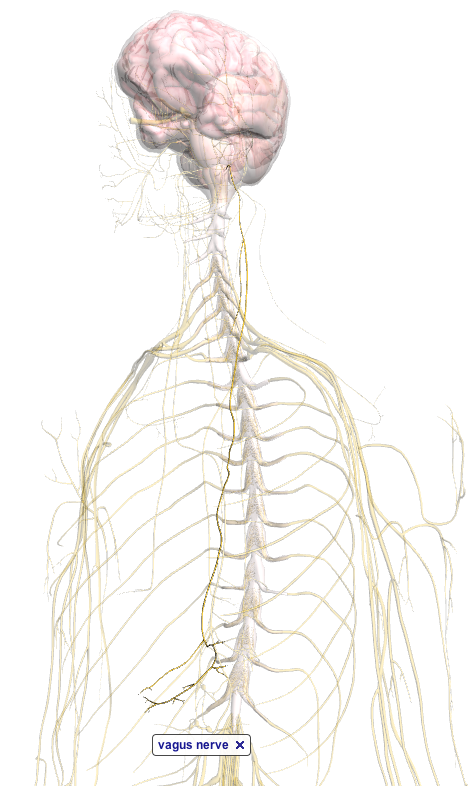 My favorite item to view is the vagus nerve, which – as I’ve blogged about here, here and here – is nothing short of a real live Kundalini serpent inside your body (well, perhaps a little short, insofar as the nerve does not extend all the way to the sacrum and muladhara, but rather just to the swadhisthana chakra). Seriously though, clinical studies have shown that stimulation of this nerve, brings a relief from anguish, and many a yogi knows how to activate this nerve via breathing and other bodily maneuvers. Here’s a screenshot from the body browser.